Each $57 box contains 16 packs. Each pack contains 7 cards. 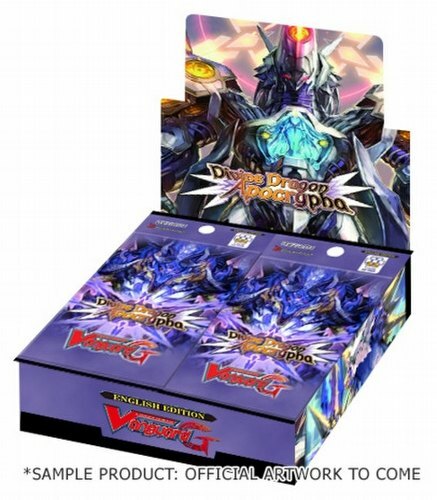 Bonus Offer: You will receive a free Cardfight Vanguard play mat with every 5 boxes of Divine Dragon Apocrypha boosters pre-ordered! The Cardfight Vanguard Divine Dragon Apocrypha set features the Zeroth Dragon of United Sanctuary and Dark Zone. With these cards, Zeroth Dragon from all 6 nations have gathered. "Dragon Deity of Destruction, Gyze" descends too. The set also features many trump cards ("Altmile", "Minerva", "Shiranui", & "Gastille")that can be used to face off against Gyze. The set includes 3 different normal reissued cards and 3 different special reissued cards. Each booster box contains 16 packs. Every pack includes 7 random cards, 2 of which are Rare or better. There are 100 cards in the set (97 new/3 reissued) - 3 ZR, 2 GR, 9 RRR, 13 RR, 24 R, 49 C, plus 12 SP Parallels, 3 Special Reissues, and 6 Secret Rares. Every box includes 1 of 2 possible promo cards.